Mohawk Industries, a flooring manufacturer with roughly 21,000 U.S. employees, has achieved a level of success in its wellness activities that would make most employers envious. The company, based in the northwest Georgia town of Calhoun, currently self-insures about 32,000 people— staffers and their dependents. Mohawk has limited its total medical spending growth to an average of 2% per year for the past eight years. It has done so with closely managed on-site medical clinics, without creating a narrow network of providers and also without an accountable care organization. Mohawk, like most large employers, is not involved in an ACO, and like many large employers, has no interest in doing so. "I don't believe the incentives that the ACO drives are the right answer," said Phil Brown, senior vice president of human resources. "If a patient goes to the doctor but doesn't go back for follow-ups, that's not under the doctor's control. They don't control the patients and they don't control all the variables." Large employers currently are tepid backers and users of ACOs. 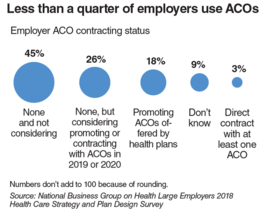 While companies are looking for creative ways to manage utilization without employees skimping on necessary care, the percentage of companies that are offering an ACO for any of their employees is relatively small, said Rita Numerof, president and co-founder of consultancy Numerof & Associates. A recent survey of large employers by the National Business Group on Health found that just 21% of respondents use an ACO. And though another 26% are considering their use, 45% are not. Mohawk first tried to improve the health of its employees and the dependents it insures back in 2007 with a disease-management program. It failed, Brown said. Businesses seeking to implement population health for their employees and dependents have many avenues, but find it takes trial and error to get results. That first attempt didn't work because the data weren't available to have a full picture of members' health, so costs kept climbing, and employees did not want to participate. Mohawk had tried to persuade employees and spouses to get tested for high cholesterol, hypertension, pre-diabetes and diabetes—and share the results with its long-time health insurance administrator Cigna Corp.—by giving them $500. "We thought $500 was a reasonable incentive, but it didn't drive a lot of participation," Brown said. Now, 97% of adults covered by Mohawk "know their numbers," after the company shifted to using a stick rather than a carrot. If employees and dependents do not share their test results with Cigna, Mohawk charges an additional $125 a month in coverage premiums. That's the most it can charge under Equal Employment Opportunity Commission guidance on wellness programs, which limits such charges to 30% of the cost of the insurance. AARP, which markets health insurance, argues that the 30% rate is too high. A recent federal court ruling prompted by an AARP court inquiry asked the EEOC to justify its instructions to employers that a 30% surcharge is allowable, saying that such a hefty penalty means that wellness programs aren't truly voluntary. Mohawk Industries' wellness coaching isn't the only thing that's been refined over the years at the company. Employees also have learned to adapt to the high-deductible health plan, according to Phil Brown, senior vice president of human resources. Back pain was the focus of one adaptation. He said he once talked to someone who runs a large orthopedic practice in Atlanta who told him that if Mohawk could get everyone complaiing of back pain to complete a course of physical therapy, "you'll reduce your surgeries in half. ""I said, cool, that's easy," Brown said, until he learned that only 30% of patients complete the full course of therapy.Why? The first visit is expensive, and everyone at Mohawk is on a high-deductible plan, though the company contributes $400 to a health savings account for individuals, $800 for couples and $1,100 for families. Half of those company contributions are paid at the beginning of the year, the rest comes as a match to the employee's contribution.The company began a pilot three months ago, placing a full-time physical therapist at an on-site clinic, making appointnents more convenient.Patients pay a fee for visits, but it's cheaper than going to providers in the community, Brown said.Results are pending. Mohawk's program, while not a part of a complicated ACO, takes a lot of effort and attention from the company's staff. Officials don't see the individual-level data on their employees, but Cigna's on-site nurses and a doctor do know who has elevated glucose levels, diabetes, high cholesterol or high blood pressure, as well as the people who are overweight or obese but do not have any chronic conditions. At locations where Mohawk employs at least 800 people, the company operates a full-time clinic, and in other locations it provides kiosks offering video appointments. About 67% of covered lives have access to an on-site clinic or kiosk, and spouses are welcome to visit those clinics too. Brown said that early on he asked clinic staff what they were doing besides offering exercise and nutrition tips to employees. "So what are you doing to help me change my behavior," he remembered asking the providers. If an employee could lose weight on their own, they would be doing it, he told them. He said there was some pushback from clinicians at first, and some nurses felt they weren't equipped to be health coaches. Those nurses now have the option of connecting employees with a health coach. Cigna classifies test results as green, yellow or red. Mohawk then prioritizes members' coaching depending on how far above normal any one result is, or if there are multiple "yellow" markers. The company requires that those who are tagged for coaching set goals and make progress toward the goals. If they don't, they get charged more. For high cholesterol, the goal is easy: take your medication. In the general population, Brown said, 50% of those with high cholesterol get it managed by medication. At Mohawk, it's 91%. Maintenance medication is free. For pre-diabetics and diabetics, 84% of patients are making progress toward their goals, he said, but about 10% of the gap are new hires who had their biometrics taken when they started and have not yet started with a health coach. The others, Brown said, tried to change their habits but fell off the wagon and need to be re-engaged. "We reach out to them multiple times before we charge them," he said, That includes people who have declined to be tested. "Saying I'm going to do better, that doesn't count," he said. Goals must be measurable. Employees and dependents are required to update their biometrics every two years, and 2018 will be the third round. The average age of adults on Mohawk's plan is 45, and Brown said about 11% of the population is moderate to high risk. While Mohawk has changed how it structures incentives for its employees, providers continue to be paid in a traditional fee-for-service arrangement. Mohawk doesn't use a narrow network to control costs, either. To be in-network, all Mohawk asks is that providers link their electronic health record systems to Cigna. Brown noted that a few practices said they couldn't do that, so they're not in the network. He said 99% of treatment is in-network, and when someone on the plan needs cancer treatment or other specialty services in Atlanta, the company adds those facilities to the network for that client. But, Brown said, managing the data has been challenging. He said in 2009 the company had 14 vendors, and his staff couldn't integrate all the data. Even three years ago, he said, the company didn't have the data to know if adults with chronic conditions were managing them well. Next year, Mohawk will launch a data system in northwest Georgia, where half of its employees reside, that will allow all the community providers to share their data through population health software from Lightbeam Health Solutions. Everyone will be able to see a complete file of a patient's care, whether it's from an on-site clinic, primary-care practice or any specialist. 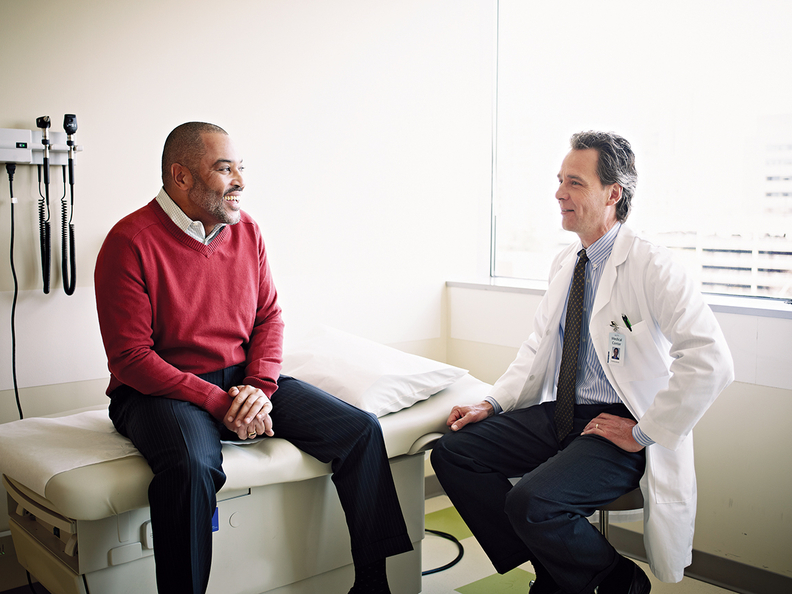 "Next year, with clinical integration, it will be even better," he said. The verdict is still not in regarding the effectiveness of ACOs, whether backed by Medicare or a commercial or self-funded health plan. HHS' Office of Inspector General recently released a report indicating savings can be had through the model. ACOs participating in the CMS' Medicare Shared Savings Program reduced spending by about $1 billion in the first three years, according to the OIG. Most of the 428 ACOs in the first three years of the shared-savings program reduced Medicare spending compared with their benchmarks, and a small group of those ACOs produced "substantial" savings. The vast majority of the ACOs—82%—also improved the quality of care they provided, based on data from the CMS on 33 quality measures. They outperformed fee-for-service providers in 81% of those measures. "While policy changes may be warranted, ACOs show promise in reducing spending and improving quality," the OIG report concluded. The news may be even better for employer- or insurer-backed ACOs. Michael Chernew, a health policy professor at Harvard Medical School, said commercial ACOs have not been as widely studied as the Medicare ACOs, where both quality and cost results are publicly available. But he said most evidence suggests commercial ACOs do better on controlling spending growth than Medicare ACOs have so far. He said there is widespread variation in results, but commercial payers contracting with ACOs have two advantages—they have a better ability to coordinate and customize agreements with local providers than Medicare does, because that organization must have a national protocol, and commercial ACOs' can shift where people get care. Chernew said a study he co-authored on ACOs in the Boston market found that one of them achieved savings by shifting patients away from the pricier hospitals. That has worked for Health New England, the insurance arm of Baystate Health, based in Springfield, Mass. Dr. Mark Keroack, Baystate's CEO, said the health plan has about 120,000 commercial members out of more than 200,000 covered lives. "Most of the time they are interested in aggressively managing costs," Keroack said of the commercial clients. He said receiving more timely data on the people covered by Health New England has been critical to "reduce out-of-area leakage." He said about 10% of the insured customers account for 20% of the amount spent, and two-thirds of those people are going to Boston for care when the same services are available in western Massachusetts at a much lower cost. "Our prices are 50% of theirs," he said of the Boston providers that have what he called a "brand mystique." So far Health New England has been able to persuade more enrollees to stay local for services such as spinal fusion and cardiac procedures. While the insurer posted significant losses in 2015, last year "the health plan was more of a profit center than the delivery system," Keroack said. 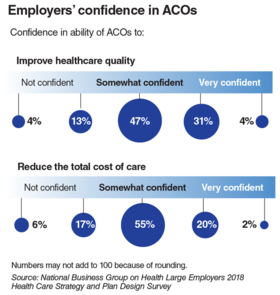 In the National Business Group on Health survey, among the companies served by ACOs, 68% are somewhat confident that their ACOs will reduce the total cost of care and 24% are confident or very confident the approach will save money. Said Harvard's Chernew, "It's certainly true that the ACOs are not the big home run" in bending the healthcare cost curve. "On the other hand, maybe they're a blooped single." He said that even if ACO savings are small, it's worth continuing to explore the approach, since there has been no big home run in bending the cost curve anywhere else. "If someone offers you a dollar and gives you a dime, take the dime."